Yunatsite (Bulgarie): vestiges of one of the first urban settlements in Europe. 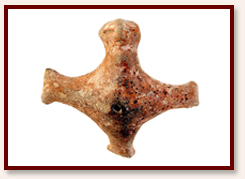 Ancient mound in Bulgaria yields vestiges of one of the first urban settlements in Europe. A team of archaeologists have unearthed additional evidence of what may have been Europe's first civilization at a site located near the town of Pazardzhik in southern Bulgaria. Known as Yunatsite, it is a Tell (mound containing archaeological remains) about 110 meters in diameter and 12 meters high, rising above fields next to a small Bulgarian village by the same name. The Tell contains remains of an urbanized settlement dated at its earliest to the early fifth millenium BC. Directed by Yavor Boyadzhiev of the National Institute of Archaeology and Museums, Bulgarian Academy of Sciences, excavators have unearthed artifacts such as weapons, Spondylus jewels, decorated fineware pottery, shards marked by characters/pictograms, and evidence of structures dated to 4900 BC, including fortifications and a recently discovered wooden platform that was likely the floor of a building that had been destroyed by fire. The excavations are revealing an age-old story of warfare and human cruelty. Writes Boyadzhiev, et. al. at their website: "The Copper age settlement was destroyed by invaders around 4200-4100 cal. BC. Among the ruins of the last Chalcolithic horizon are found the skeletons of its last inhabitants (mainly children and elderly men and women): a testimony of a cruel massacre. Those who survived returned and resettled for a while the devastated settlement but soon even they left it and Tell Yunatsite was abandoned for more than 1000 years". 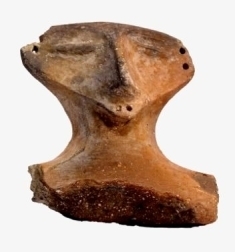 Research has shown that, beginning in the seventh millennium BC, the Balkan Peninsula was a gateway or corridor through which Neolithic culture, including farming and animal husbandry, spread from Anatolia and the Near East. Beginning in the fifth millennium BC, human populations in the central and eastern Balkans began developing metal-processing technologies, notably that of Copper, into a relatively large-scale industry for the first time in world history. The world's oldest copper mines, for example, were found by archaeologists near Rudna glava, Serbia and Mechikladenets/Ai bunar near Stara Zagora, Bulgaria. Moreover, writes Boyadzhiev, et. al., : "Archaeological evidence shows that in the fifth millennium BC these prehistoric cultures enjoyed a constant rise in population and wealth, meanwhile experiencing social stratification due to intensive trade with metal products, salt and other goods with the rest of prehistoric Europe and Asia. These Balkan Copper age cultures had all the characteristics of the first civilizations, including: the very first urban settlements in Europe (Tell Yunatsite, Durankulak and Provadia in Bulgaria), dense networks of settlements, “industrial” proportions of production of goods, especially metal products and salt, developed trade, distinguished social and professional stratification, pictograms and characters interpreted by some scholars as the world’s oldest script (Gradeshnitsa tablet for instance dates back to the sixth or early fifth millennium BC) as well as precious artifacts made of gold, pottery, bone and stone (the world's oldest gold treasure was found in the Varna Copper age necropolis)". In 2013, archaeologists hope to continue to explore, among other things, the Early/Middle Copper Age structures and the earliest prehistoric fortification wall of the settlement. 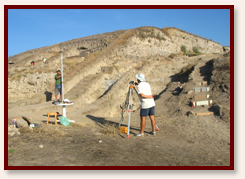 More information about the Tell Yunatsite excavations and how individuals can participate in these investigations can be found at http://www.bhfieldschool.org/bh2013yunatsite.html, the website for the Balkan Heritage Field School.